Easter Cassia (Senna pendula var. glabrata) is a native to South America (Brazil & Paraguay) and so named as it mainly flowers over autumn (Easter), although some flowers may occur all year. It is a widely distributed species that has become naturalised in the eastern parts of Australia and is most common in the coastal and sub-coastal regions of SE Qld and northern NSW. It grows as a sprawling shrub up to about 5 m tall. Each leaf is composed of 3-5 pairs of dark green leaflets with rounded tips. These leaflets are egg-shaped to oval, with those closer to the stem generally being smaller. It produces masses of bright yellow flowers about 3 cm across. The flowers are borne in clusters at the end of the branches followed by narrow round pods up to 12 cm long. The pods turn from green to brown as they mature and contain 5-10 black seeds. Easter Cassia is a successful invader of disturbed or modified sites and is a weed of waterways, gardens, waste areas, roadsides and urban bushland. It invades native ecosystems and is a fast growing plant that can suppress the growth of native species and displace them. It produces large amounts of long-lived seeds. The seeds are spread by water and in contaminated soil with dispersal often occurring in dumped garden waste. 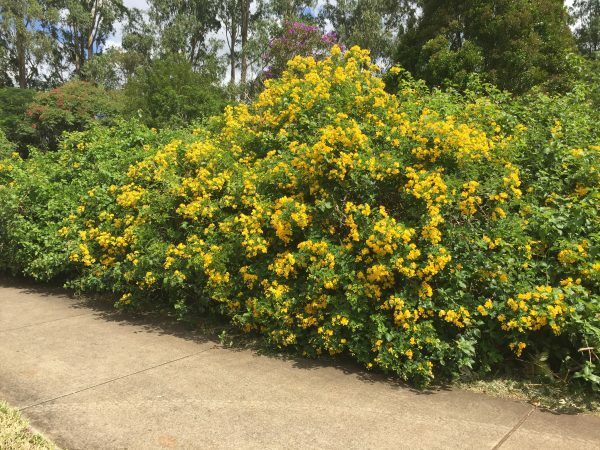 Easter Cassia is not a prohibited or restricted invasive plant under the Qld Biosecurity Act 2014. However by law, everyone has a general biosecurity obligation to take reasonable and practical steps to minimize the risks associated with invasive plants & animals under their control. 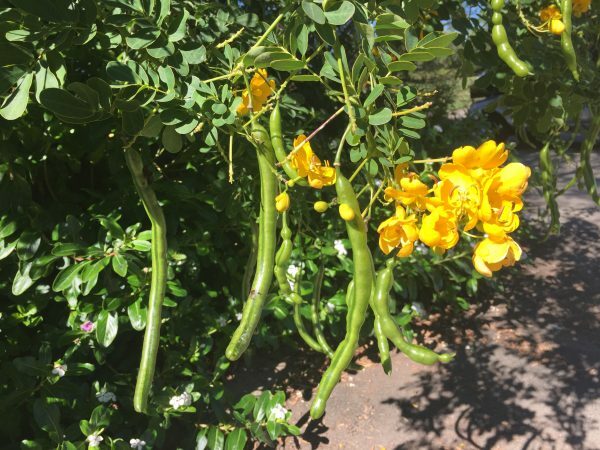 If you are unable to remove plants from your yard at least remove the pods so that the seeds will not be available for further spreading.